Given the chance, fifteen-year-old Peregrine 'Perry' Eckert would dedicate every waking moment to Creatures & Caverns, an epic role-playing game rich with magical creatures, spell casting, and deadly weapons. The world of C&C is where he feels most comfortable in his own skin. But that isn't happening—not if his parents have anything to do with it. Concerned their son lacks social skills, they ship him off to summer camp to become a man. They want him to be outdoors playing with kids his own age and meeting girls—rather than indoors alone, with only his gaming alter ego for company. Perry knows he's in for the worst summer of his life. 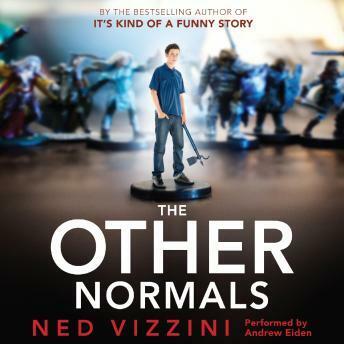 Bestselling author Ned Vizzini delivers a compulsively readable and wildly original story about the winding and often hilarious path to manhood. An interesting story... This was not my usual type of book to read but it was very interesting story and I enjoyed it. In fact if it had not had the few sections with foul language I would have my son listen to this book. He is 12 years old and would probably find the story very enjoyable as well.